Examples of branding have survived from antiquity, such as the mosaic promoting the garum sold by Umbricius Scaurus of Pompeii with the slogan “the flower of garum”. However, it was not until the advent of the printing press that we start to see the creation of printed advertising and marketing as an idea starts to flourish. The Gutenburg press was developed in Europe around 1440, and brought with it a dramatic growth in education and the entrepreneurial spirit, but the printing press has much earlier origins in China, where movable-type printing was invented three centuries prior during the Song dynasty. 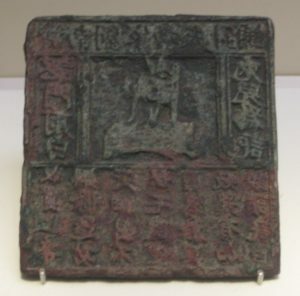 Indeed, the earliest example yet discovered of a commercial advertisement is a bronze plate for the Liu family needle shop at Jinan. Back in Europe, thanks to Gutenburg’s invention enabled the large-scale and cheap production of handbills, posters, flyers, and pamphlets, and paved the way toward the creation of newspapers and advertising-supported mass-media publishing. Emperor Augustus established the Cursus Publicus, a state-run courier service for the Roman Empire, over a millennium ago, and various monarchs established official postal services throughout Europe in the Middle Ages. However, it was not until the development of the printing press that inventive business owners started to use the services to promote their goods and services. Following the industrial revolution, English entrepreneur and potter Josiah Wedgwood pioneered the idea of direct mail marketing to cater to the demands of England’s burgeoning middle classes, distributing illustrated catalogues to drive sales and backing his products with innovative securities such as the money-back guarantee. The first radio broadcasts were transmitted in the early 1900s, but it was not until after the First World War that consumer radio sales started to take off and radio emerged as a platform for businesses to reach consumers. 1922 saw AT&T launch the idea of “toll broadcasting” where advertisers could underwrite the cost of producing and transmitting a broadcast in return for being mentioned on air. It quickly became apparent to businesses that radio offered a new and clever way to get their message heard by consumers at home and radio advertising exploded. While we now think of soap operas as a television format, the name comes from serialised radio shows broadcast during the day, with advertisers such as Colgate-Palmolive underwriting the costs of the shows in return to advertising products such as soaps and other cleaning products to the primarily female audience. The success of radio spurred technology companies to invest heavily in the research and development of a new form of broadcasting called television, or TV – and advertising dollars were not far behind. Like radio, television gave advertisers the chances to broadcasting their messages directly into people’s homes, but with the added benefit of imagery such as logos or product demonstrations. Not only does television provide a brand-safe platform for advertisers to broadcast their messages in-between shows, but product placement gives them a subtle method to display their wares while viewers are actively engaged in the content. In essence, the internet is a large and unruly combination of all media that came before, and has opened up a huge new marketing opportunity for advertisers. 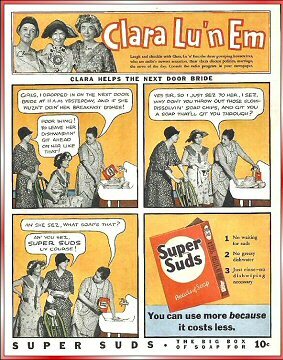 Those looking for audio content have radio streams and downloads, with podcasts such as Serial revitalising the industry for ad-supported audio dramas that were popular in the 1930s. And music radio is quickly being replaced by Spotify, where almost all music ever recorded is available to listen to for free with a few interruptions for ads. While radio advertising targets people at home or at work, podcast subscribers also listen to their content on the bus, at the gym, and while walking on the streets. By sponsoring podcasts, advertisers now have access to consumers at their most personal and introspective moments – their most valuable time. Traditional broadcast television is also being replaced by the internet, with more and more people accessing their favourite TV shows via streaming services like Netflix and Hulu or via the networks’ own in-house streaming services, like BBC iPlayer and 4OD. And the advertising messages that support some of these services can now target consumers not just by the rough demographics of what shows they watch, but also now a variety of other metrics including search history or websites they have previously visited. Online magazines and newspapers are still struggling to find a monetisation strategy that offers them a route to profitability, but this means that they are continually developing new marketing options. Banner ads were first sold in the early 1990s, but consumers have become increasingly “banner blind“, which has caused online advertisers to turn to content marketing and other types of native content to generate interest in their products or services and drive sales. 2017 is expected to be the first year in which internet ad spending is to surpass television, and this trend is only going to continue as the web matures as a medium.